For use on door and window frames, skirting boards, ceilings, walls, architraves, and plasterboard. Can be overpainted in one hour. Contains fungicide to prevent mould growth. For internal and external use. 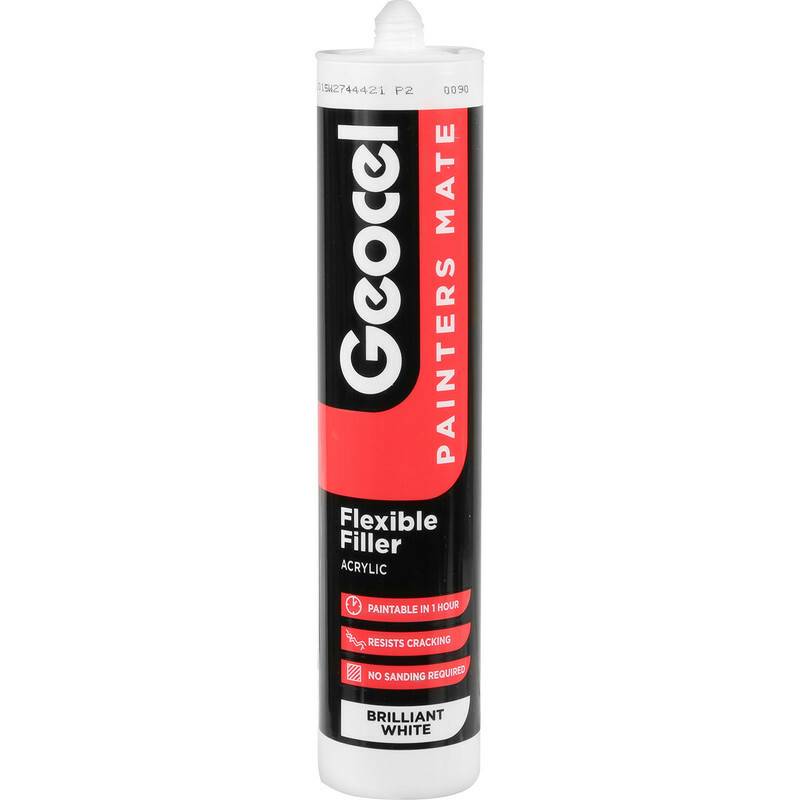 Geocel Painters Mate Decorators Caulk 310ml is rated 4.6 out of 5 by 20. Rated 5 out of 5 by Maxsteel from The Best Always use this for caulking and it has never let me down. Even found a tube i had resealed over a year before and it still worked fine. Very smooth finish and very rarely have problems with shrinkage and cracking unlike some other caulks. Rated 4 out of 5 by Jackthegripper from It's alright Bought this to finish off around new windows. Even if I say so myself I'm pretty handy at getting a good finish with silicone and other fillers. However I found this difficult to work with as it's quite loose and getting a good finish was difficult (any tips would be appreciated) and it dried onto the window frames remarkably quickly making removal of excess material difficult. I know there are many good reviews of this but personally I would not rush to buy more. Rated 5 out of 5 by Home Decor from Top quality caulk. This is a quality professional grade caulk probably the best caulk on the market. I had no issues using the caulk. As a professional decorator using the best products produces the best finish. Rated 5 out of 5 by GrahamB from Has to be one of the best. Great, decorators Caulk, does a great job and paints over perfectly. Well recommend this stuff, so much better than the cheaper brands. Rated 4 out of 5 by geriminger from Not bad. Nice and smooth Not too grainy. Can do small gaps 1-2 mm OK. Dries fast. Easy to squeeze. Rated 1 out of 5 by Maxstoke from Doesn't do what it says on the tin! Bought this item to tidy up around UPVC windows when decorating bedroom. Says quite clearly that it can be overpainted once cured. YOU CANNOT OVERPAINT this silicone product. Tried several time to overpaint with quality Dulux emulsion and it will not adhere. Made a right mess of what would otherwise been a nice decoration job. Disappointing.